Many of you have been asking me to share more specific stock ideas. As several of you might have noticed, I don’t simply like telling you to buy a stock; instead I like to explain the logic and reason behind why I am buying into it. I like providing you with questions, so that you can research the company further and understand it better. At the moment there is one more company which I have been investing in for sometime, as it is in a sector which has not been noticed by most people and is just starting to pick up. This company has a small market cap is not as well known as the previous company I shared with all of you and has been growing at over 50% since the past five years. The valuations are very reasonable at the moment and the price from the recent high has come down by almost 60%. I like calling this company a high-tech shovel because of the nature of its business. You will find out more about it in the report attached. The report is educational in nature and would help you and encourage you to study further before making this investment. This company has had a few popular investors buying into it, and what is even nicer is that presently it is available at a valuation which is much cheaper than what these investors have bought it at. I plan to hold this company for a very long period of time and I would suggest people who have a short term view to kindly not buy it if you plan to multiply your money overnight. However if you have a longer term vision and understand the power and value of knowledge in creating wealth, this could be an interesting investment to look at. As my earlier report, this too is very personal and simple to understand. I like sharing what is going on inside my mind as an investor when I am buying a company. You can find out more about it and learn how I selected this company by downloading this report here. You would be directed to a Paypal page where you can pay securely via credit card/Paypal and once the payment has been received you will be able to download the report online. Update (31/05/2008): Rakesh Jhunjhunwala had bought into this company and at the moment the stock price is much less than his buying price. Thanks for the wonderful report. I will surely invest in it and I'm going to share it with my friends at our MBA class. I have seen lots of fellow private value fund investors looking at you. I too run a small value based fund out of New York. At the moment India does look very attractive to us for the next 5-8 years. The company shared by you sounds good and I like the fact that you encourage thinking and individual research. This was a really interesting company you shared with us Yogesh and surely in a very unique space. If things do go well for it, it can really reward us investors. However as you mentioned due to the small size, the company is not for everybody. Finding such a company might have taken a lot of research, time and effort as it is in a new sector which not too many people know about. Sham- my extra research says - go for it! I agree Dilip. I went through the report and also studied more. I am just starting to see the power of thinking for myself. It gives me so much more confidence and faith. Now I can realize why investors like Yogesh, Rakesh and Warren don't really care about where markets are headed. Great education and knowledge sharing for all of us. A far cry from 'tips' given by brokers who don't know themselves what they are saying. I had lost more than 3 lakhs because of 'free tips' thrown at me by brokers. They weren't free for me and cost me over 3 lakhs. Even I had lost around one lakh because of wrong advice from broker. He would be just like 'aaj yeh le' and 'kaal woh le.' My advice to anybody is never listen to them, because they are just talking without research. Investing is not like a gamble I have realized and needs many hours of research. Reading your reports Yogesh I can see how much time and effort you put to study the company and also other things related to the company and not spoon feeding as you say makes and encourages people like me to also do some researching. I did not know that Rakesh Jhunjunwala has bought this stock and had never even heard the name of this company. I think when big investors are buying not many of us know and only when the stock moves up much more everybody comes to know. I think the best part is that this company is avaliable at a price cheaper than what even Rakesh bought it at. He would surely have studied before investing such large amounts of money. I'm going for it too. Liked this discovery more than your earlier one Yogesh. I kind of knew about that one. My main reason is also too look at it because of Rakesh. Sunil I think it is just fare that investors don't go around telling everybody what they are buying into so they can accumulate at cheap prices. People who work hard and put in effort deserve to be rewarded more than others who don't. As Yogesh says Keep smiling fellow happionaires! This is the first time I ever spent money to buy a report and it has been a good investment. I have realized that when I spend money on something I take it more seriously and try to benefit and learn as much from it. I understand better now why it is important to spend a couple of hours to do research and learn because at the end of the day we are investing our hard earned money. We invest lakhs of ruppees as if we are buying vegetables and fruits without any research and work. Thanks for bringing a mentality of investing in knowedlge first before putting actual money. It lets us have peace of mind also. I'm working at Blackstone and we are looking at India as a great story for the next decade. Growth is going to be there for the future now and we in the West know this well. The company shared by you is interesting and worth a look even from bigger funds. I agree with you Martin. Sadly many times people from abroad have more conifdence in India than we ourselves. The compnay shared can really multiply according to me because it is in an abosultely new sector. Look what happened to companies like educomp in education. I studied more after reading this report and feel that this company is worth investing in small amounts at least, because if things work out it can easily be atleast five times the size today. Just did more research and invested in this company today and it already shot up 4.99% today and is on upper circuit. I know you don't want us to think about day-to-day prices Yogesh but I think it is better if it goes up faster rather than slower. lol We will always be greedy for more! Great company sir. I made some good returns in it but couldn't buy more. The price has run up very fast. It would be great if you could share more such companies. I made great money by you sharing SesaGoa with us. Over 300% in such a short time period. This one too can be another 4-5 bagger. The potential after studying it is huge. What is great is you have shared it at such a cheap price, even cheaper than what RJ got it. Really very impressive. Great company to look at for sure. The huge order books and huge demand in our country can just change the fortune of the shareholders of this company. This is such a wonderful opprtunity to be able to buy a company even cheaper than Rakesh. Went through the balance sheet and it is incredible. I think one of the best companies you have shared with us till now Yogesh. For me this is the best company you have shared till now ti invest in. The others are good too but I am very keen on this one. It has got everything and best of all is so undervalued. A sure shot multi-bagger according to me. You said it 100% right Ankit. On doing more research and according to my estimates this company does have the potential to be a 4-5 bagger at least in the next 3 years. Surely something every smart investor should have. This is the first time i've ever bought a report. But it is according to me one of the best investments i have ever made. You report not only tells me the company but also shares the thought process in finding it. I'm now going to try and gather a list of most suppliers to big companies. For a new investor like me this report was priceless. I'm so happy that you are sharing how investors also think. I have no degree in finance or anything but I know I can learn much more than an MBA finance by just reading these reports and also studying the annual reports of great companies like Berkshire Hathway of Warren Buffett. I also picked up Dhandho Investor after you suggested it in your book. ITHW has been a book which has had a very big impact on my life. Also saw you on TV yesterday! I'm sure millions more would be investing better thanks to you. 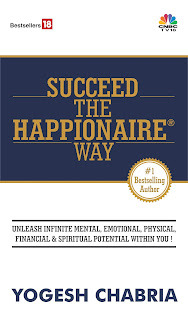 I have bought all your books after reading Invest The Happionaire Way and realized how practically you have used the ideas shared in the book to select such great companies. Today it is really incredible that thanks to you I can but a company so much cheaper than great investors like Rakesh Jhunjuwala. Thanks for informing us about the issue. We have checked our records and don't have any payment in your name and thus your credit card has not been debited. Kindly try again and if there is any issue please feel free to e-mail us on yogeshchabria@happionaire.com . Raju,I just downloaded the report. It is working and thanks Yogesh, this is a very good value buy. Almost 30% cheaper than Rakesh's price is a great thing. This was a very nice report and I have bought every report put up. I have started accumulating as you suggested and am glad I have learnt from you never to rush and buy. When this stock ran up I felt like buying, but I didn't because as you said things do come down the same way they go up. Now I can buy it almost at half the price of RJ. I know markets can go down more and I will use this as a time to buy. But just a request, can you please share more such reports with us. They really are of great help. I want to use this time as an opportunity to accumulate for the next 4-5 years. Thanks in advance. Hope you consider it. I really liked this report and have started buying into the company gradually. I am keen to evaluate this company from a Moat perspective (as per Warren Buffett / Dhandho strategies). Can you share your perspective on the strong Moats this company has ( basically what keeps it protected from competition)? I went through this report and have also read Pabrai. From a Moat perspective- simply see who else is doing the type of work this company is doing at the moment and you will see it is rare. What will stop competition from entering according to me is the fact that it will have first mover entry advantage and experience. This is an interesting find and worth looking at. Great report and great potential in company. Growth seems very good and at the moment valuations are also very attractive. Good way of presenting and researching.